Is your garden looking a bit tired and worn out after weathering a few years in our Brisbane climate? If you are looking for a quality Brisbane tree removal company that can provide you with quality mulch, then call us today. Our team at Oasis Tree Management are here to help. Whether it be tree removal, tree lopping, maintenance,stump grinding, A grade forest mulch or tree pruning, why not consider us for your next garden project. 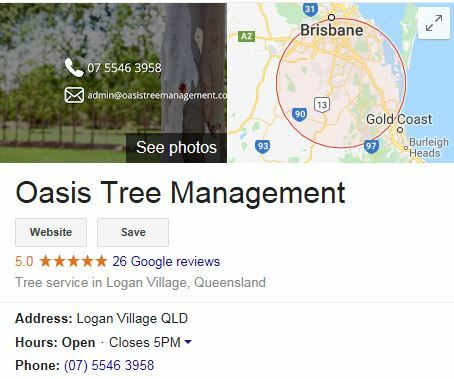 Oasis Tree Management can provide A Grade Organic Forest Mulch Delivery to Logan or Brisbane Southside suburbs, or you can arrange your own pick up from our site in Logan Village. When should you consider mulching? Mulching your garden not only looks great, but it has many benefits for keeping your garden fresh and healthy! It inhibits weed germination and growth. It helps to protect your garden by acting like a blanket keeping essential nutrients in the soil. It helps to keep the soil and plant roots cooler. and reduces water loss through less evaporation. When considering mulch, you can’t just go with the cheapest. If mulching isn’t done correctly you could find that tannins from the mulch end up making your garden areas look worse, and the plants a lot worse off than they do now! Quality Forest mulch is created from tree pruning, canopy reduction and tree removal. Oasis Tree Management don’t just provide regular old garden mulch, we provide A grade forest mulch, that will ensure your garden beds look great, and your plants are healthy! Our A grade forest mulch is sold at a competitive $25 per cubic meter, so not only is it a quality product but great value for money. Please note our minimum delivery order is 10 cubic meters. Logan & Brisbane Southside surburbs will incur a small delivery fee however if you are located in Logan Village or Jimboomba delivery will be free. To have your mulching done professionally, reliably and economically, simply phone Oasis Tree Management today on 07 5546 3958 to book your order.